This is an email that was sent by an Academy @ Shawnee Sophomore to Dr. Hargens on Sunday, Nov. 27. She asked that Dear JCPS publish it our our open letter forum. FINALLY, OUR MAGNET PROGRAMS HAVE NOT CHANGED; STUDENTS WILL CONTINUE TO RECEIVE SUPPORT AND RESOURCES FOR ALL OF OUR CURRENT MAGNET PROGRAMS. When Ms. Benboe and the District transfers the magnet coordinator, Col. William Vander Meer with no plans to replace him, then to say that the magnet programs will not change is a contradiction. The programs changed at 2:30 in the afternoon on Nov. 4 when the Colonel was told that he was being transferred to Central High School, effective immediately. We, the students, will not continue to receive ALL the support and resources that were available to us with the Colonel gone. I’ll share with you an example about the aviation program. On November 5th, the day after his transfer, there were about 15 Shawnee Middle and High school students that were to meet him at Hanger 7 at Bowman Field, to take plane rides. Only because he holds a seat on the Board of Directors for Hanger 7, were those students, myself included, still able to go on the plane rides. I actually got to fly a plane and logged air time for the first time that morning. Those types of outings and programs were the direct result from the Colonels passion for the kids, for learning and for the excitement of aviation. Another example that maybe you are not aware of, is a new program with UPS, which the Colonel was able to arrange for our school. The freshman this year will be paired up with UPS pilots. The pilots will follow and mentor, one on one, the students for their entire 4 years in high school. What an opportunity. Once again it was because of the Colonel’s connections with the community and his drive for the success of the Academy@Shawnee. I could you give example after example, if you care to listen, of how the Colonel’s 19 years of experience and his community connections promotes all of the students attending the Academy@Shawnee’s Middle and High Schools. He was one of a few administration personal that was bridging the Middle school to the High school. However, I would like to share with you how I felt when I was attending the Board meeting that night. 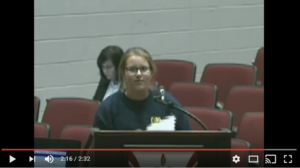 During the first part of the meeting when schools were getting recognized, I was sitting in the audience getting frustrated, hurt and then angry. All of these schools were talking about teacher relationships with their students and how awesome of an experience that is. Our school has teachers leaving to go to different school to teach every single day. So, to have the few remaining in our building meant the world to me and to the other 150 children that signed our petition. The swift and quiet transfer of the Colonel just feels like a punishment. A punishment in which our school does not deserve. I have already had the experience earlier this year of a teacher being fired by the District and then just 6 days later she was reinstated by the District to her teaching position. So, that is why I am asking you again: Dr. Hargens, will you please transfer Col. William VanderMeer back to the Academy@Shawnee?